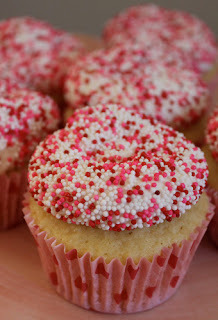 It may seem a little early for Valentine's Day recipes, but I consider this the perfect vanilla cupcake recipe. This can be used as a blank slate to celebrate any holiday! The cupcake itself is moist with a delicious vanilla taste, and the frosting is so light and fluffy. This recipe is going straight into my recipe binder. 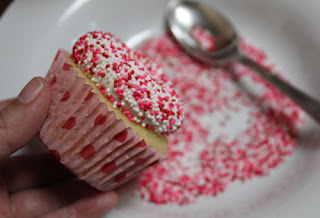 You can start with the base and use food coloring to decorate the cupcake for the season, or do what I did and just use simple cupcake wrappers and festive sprinkles. 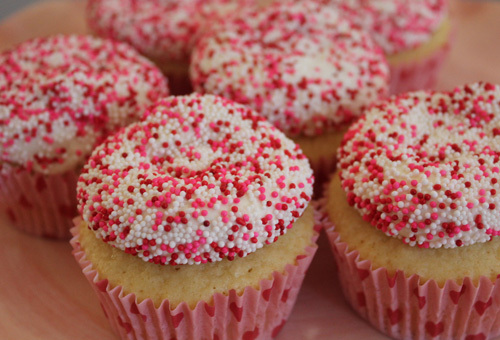 Cupcakes are always better with sprinkles. To apply them, I filled a low bowl with the sprinkles I wanted to use. You can combine colors and decorations, but I stuck with a basic pink, red and white mix. 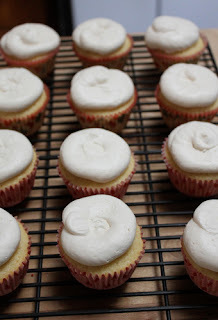 Fill a piping bag (or a ziplock bag with a corner tip cut off) with frosting. Once you pipe the frosting onto the cupcakes (you can also just frost it with a knife, but piping will give it a cleaner look), hold the cupcake over the bowl of sprinkles and use a spoon to pour the sprinkles until the frosting is covered. 2. Mix together flour, sugar, baking powder, and salt in bowl of standing mixer fitted with paddle attachment. Add butter, sour cream, egg and egg yolks, and vanilla; beat at medium speed until smooth and satiny, about 30 seconds. 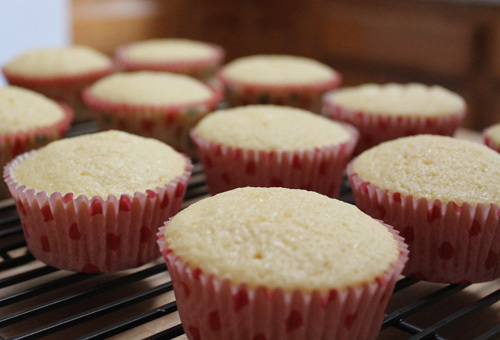 Don't over mix or the cupcakes will be dense. Scrape down sides of bowl with rubber spatula and mix by hand until smooth and no flour pockets remain. 3. Pipe and decorate your cupcakes. Enjoy! Oh my gosh, these look amazing! Yum! It's never too early for Valentine's Day cupcakes! I love how you dipped the frosting in sprinkles, very pretty. They look so yummy and adorable!